In the UK, employee absence as a result of back pain, headaches, stress, anxiety, and RSI (repetitive strain injury) has a significant impact on cost for employers. Many employers are now looking to enhance or develop their corporate health and wellness programmes in order to reduce the effect of stress on personal and company performance. The good news is that On-Site massage can have a very positive effect on reducing stress in the workplace and therefore improving profits. ‘It only takes 15- 20 minutes of On-Site Chair Massage to make a huge difference to how you feel for the rest of the day’. 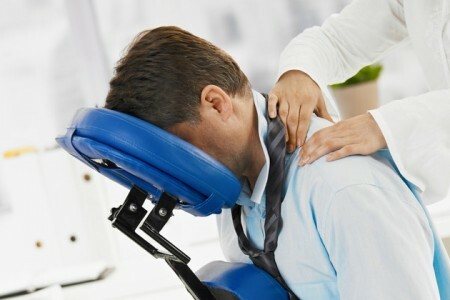 On-site chair massage is based on a combination of Swedish massage, acupressure and shiatsu techniques and is non-invasive with the client remaining fully clothed at all times and no oils are used. While the first part of the sequence is relaxing, the second stage is revitalising, meaning that clients return to their work environment feeling more energised and productive. I bring an ergonomically designed ‘On-Site’ Massage chair to your office – all that your business needs to provide is enough space for the chair and for me to work around. Appointment slots can be either 15 or 20 minutes. In some cases, clients like to book a double session e.g. for half an hour at a time. The massage that the client receives, works on the muscles of the back, head, shoulders, arms and hands. In a working environment, these are often the areas where tension is held and so the benefits of massage and reduction in stress levels can be enormous. The cost of this can either be borne by the company in full as a benefit for employees, or shared with the employee by the company subsidising it in part, or by the employee paying it themselves and having it over a lunch or tea break. Another possible option is to use this type of ‘On-Site Massage Therapy’ during a motivation or reward day for employees – for example as an incentive or as special feature of a training course or management meeting. It could also be suitable for a company offering it to their own customers during a sales event or perhaps a corporate hospitalityday. In addition to supporting employees by putting measures in place to reduce stress and absenteeism, offering a service such as this is a great PR story for a company wanting to attract good people. Contact me directly to discuss we could adapt this to suit your organisation. “Our office staff all run at 100% constantly and bringing in Shelagh for chair massage has turned into a great incentive for the team. Initially management were sceptical about how a massage could boost productivity but it has proved to be a winner.